The regions’ borders are the river Durance in the north, the river Rhône in the west, Mont Sainte Victoire to the east and the Mediterranean in the south. Running east-west across the region, parallel to the sea, are a range of hills – the Nerthe, Fare, Eguilles, Trévaresse and Costes. 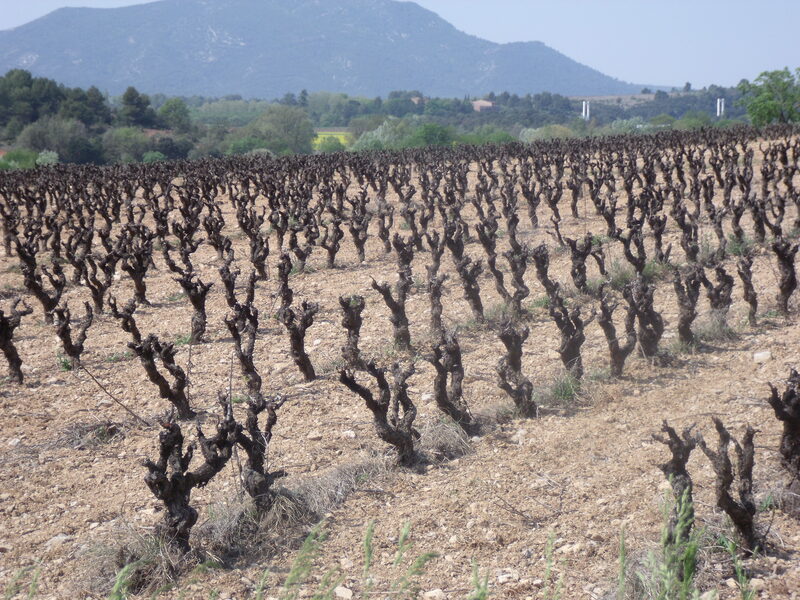 The soils include alluvial, washed down by the Durance and Arc rivers, clay, chalk and sand. For the first time, the vineyards of the region were identified according to one of four distinct regions. Does this herald plans for sub-appellations within this large zone? 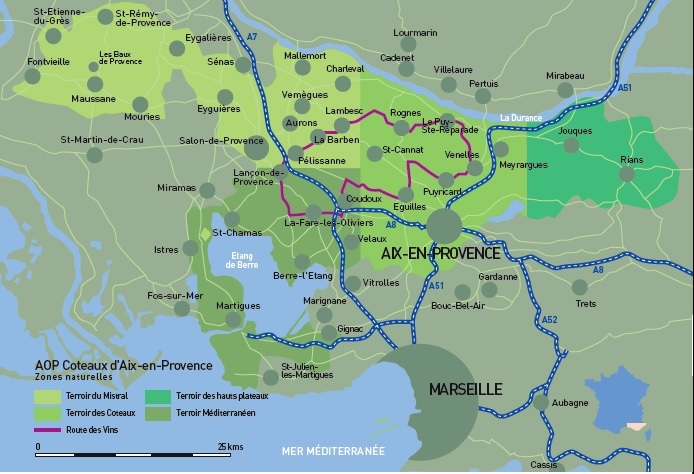 Terroir Mediterranéen: The most southerly region, low lying (0-100m) area located around the large saline lake Étang de Berre. The hottest part of the region tempered by maritime winds. The grapes ripen early and in 2014 the harvest started between 15-20 August. 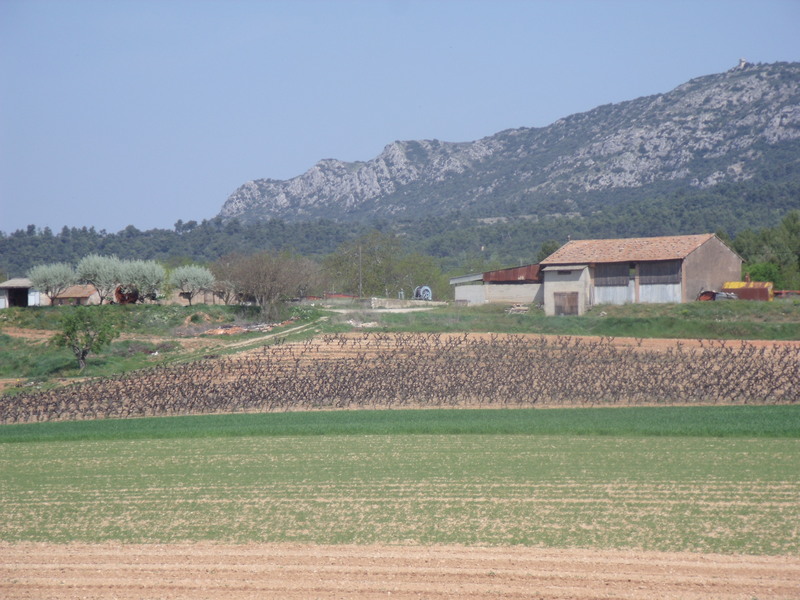 Terroir du Mistral: The north-westerly region, located between the lower banks of the Durance and Rhône (50m) and rising up to the foothills of Les Alpilles (200m). The Mistral wind (a cold, northerly wind) is dominant in this region, resulting in very dry conditions, preventing rot and moderating the heat. The harvest is a few weeks behind the coastal vineyards, starting around 1 to 5 September in 2014. Terroir des Coteaux: This is the heart of the appellation with vineyards located on the foothills (Coteaux) of the Eguilles and the Trévaresse hills and rising from 100 (in the north near the Durance river) up to 300m. The aspect of the vineyard – facing north or south adds extra complexity. The harvest falls a little later, starting from 10 to 15 September in 2014. Terroir des Haut Plateaux: This is the coolest region, the plateau lying between 200-450m. The area is colder, more continental, cooler alpine winds from Mont Ste Victoire. Late springs and fresh autumns. The harvest is the latest in the region, starting from 20-25 September in 2014. 83% of the production of Coteaux d’Aix wines are rosé. 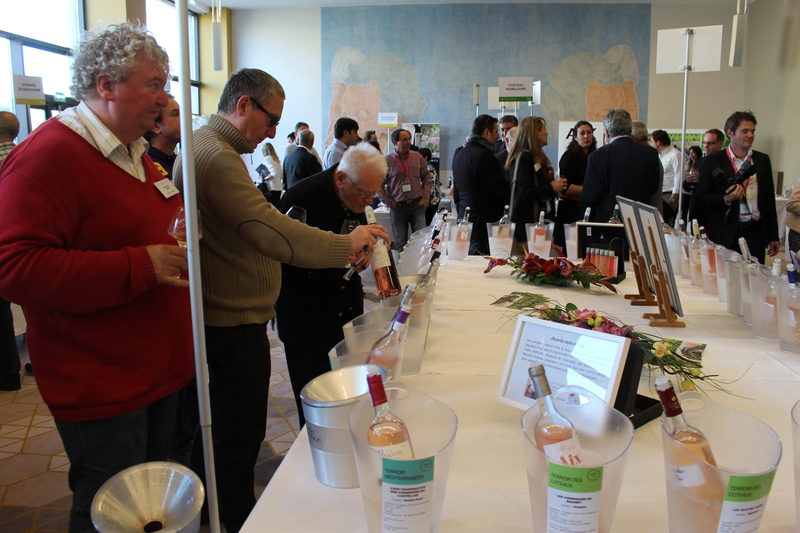 I tasted thirty nine rosés, of which 26 stood out, for me, as being of interest: 3 from Terroir Mediterranéen (out of 5), 4 from Terroir de Mistral (of 7), 13 from Terroir des Coteaux (of 19), 6 from Terroir des Hauts Plateaux (of 8). In my review of the rosés of Côtes de Provence I felt the wines fell into five different groups covering the range from primarily fresh red fruit, through darker, rounder fruit, creamy peach fruit and finally a more mineral austere style. The wines of Coteaux d’Aix have their own distinctive style, and I have slightly altered the range of wine styles to reflect this. On the whole they were a touch darker pink and wines had, on the whole, a touch more structure and weight than the rosés of Côtes de Provence. This greater weight appeared evident in the different fruit styles. The red fruit was ripe and round as opposed to the fresher wild berry fruit found in Côtes de Provence. Grenache featured in 32 wines, but only 12 included Cinsault. 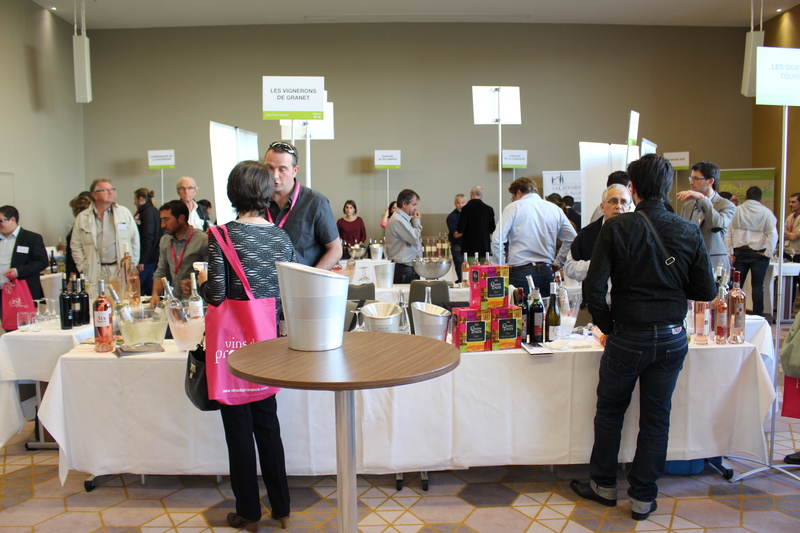 None of the wines tasted had the soft, round black fruit character found in some of the Côtes de Provence wines, although one or two had a touch of black fruit. Only two wines tasted included Mourvedre while 35 included Syrah, and 12 of these also had Cabernet Sauvignon. Nearly all had the more mineral notes to a greater or lesser extent. The two most mineral, salty and austere wines came, interestingly enough, from the coast, reflecting the Côtes de Provence maritimes saline character. The lees and oak character of some of these wines are not unique to this appellation, but in the wines here, these characters were more dominant than the fruit. I also added an extra category, ‘off-beat’ which I have used it to indicate a wine style which is maybe not the most commercial of styles, and a wine which would not win medals in a competition or blind tasting next to more classic Provençal rosés. For the one wine which fell in this category here, I loved the creativity and character of this dark pink/pale red wine. Fresh, crisp red fruit, and good acidity. Fresh, crisp red berry fruit, and good acidity. Ch Pigoudet ‘le Grand Pigoudet’ Cabernet Sauvignon Syrah 2012 Pale red. Saignée. Vinified in barique, aged sur lees. Good balance of fruit, acidity and weight. (Terroir des Haut Plateaux). NB prices were not taken into consideration when evaluating these wines.